According to Japanese mythology, the islands of Japan were created by two deities, Izangi and Izanami, when they struck a spear into the primordial sea; the water dripping from its point formed the first islands of Japan. The early peoples of Japan believed the world was alive with kami, the spirits and deities of the natural world and natural phenomenon. Kami were everywhere, present in trees, rivers, rocks and mountains, and part of the wind, the agricultural cycle and earthquakes. The mountains in particular were invested with kami, because they were nearest to the heavens and it was believed that when a person died, his soul climbed the mountains on its way to heaven. The kami profoundly influenced human affairs, and the natural world was both a place of material sustenance and holiness. This Japanese tradition of nature worship and animism became known as Shinto. In the 6th century, Buddhism was introduced to Japan from the Asian mainland, with its emphasis on personal spiritual development and enlightenment. The Buddhist belief in the interconnectedness of all life complimented Shinto beliefs, and Buddhist temples were built that incorporated or co-existed with Shinto shrines. Kami were syncretized into the manifestations of Buddhist divinities. By the 9th century, Shingon—a combination of Shintoism and an esoteric branch of Buddhist practice—was established high in the mountains of the Kii Range. It was there that Shinto also combined with Buddhism and Taoism to form Shugendo, an influential ascetic sect whose adherents retreated to the mountains for spiritual training. The Kii Mountain Range is ecologically biodiverse and contains hundreds of significant archeological and architectural sites. It is heavily wooded—in fact, Japan is one of the most heavily wooded countries in the world, with 67 percent of its land covered by forests. The trees of the Kii Mountain Range rise from the coast of the southern sea to mountains nearly 4,000 feet high. In between are river basins and gorges, streams, hot springs and waterfalls. Forests include old-growth and secondary-growth forests, with some trees that are 500 years old or older. The Kii Mountain Range features a diversity of tree species as the mountains climb from a warm temperate zone to a subalpine zone. Tree species range from evergreen, coniferous, broadleaf, cedar and cherry. Three sacred sites in the Kii Mountain Range are part of the UNESCO World Heritage site: the mountain region of Yoshino and Omine, the religious center of the Shugendo sect; the remote mountains, river gorges and coastline of Kumano Sanzan, site of several important Buddhist and Shinto shrines; and the holy temple complex of Mount Koya, the headquarters of the Shingon sect. Pilgrimage to the area has been documented as early as the 8th century. The patterns of the pilgrimage routes themselves serve as geographic mandalas, tools used by pilgrims as part of their meditative practice. Japan’s emperors and samurai warriors popularized the pilgrim routes with frequent travel to the Kii Mountain Range to pay devotion at the shrines and temples. Commoners also took to the pilgrimage routes, to pray and deepen their spiritual practices. The sacred sites inscribed as part of the World Heritage designation are all home to wooden temples and shrines that are pilgrimage destinations. Pilgrims often stayed as guests in temples, a practice that continues today. At Mount Koya alone, there are over 100 temples and shrines. Mount Koya is the site for Japan’s largest cemetery, where some of the country’s most famous and revered historical figures are buried. It is also home to the leading school of Shingon education. It is said that the living spirit of Kobo Daishi—a venerable cultural figure who not only founded Shingon but wrote poetry, designed architecture, built dams, and created calligraphy art—still resides in Mount Koya. Kumano Sanzan was historically the most remote of the World Heritage sites, but has long been the most popular along the pilgrimage routes. Several important Buddhist and Shinto temples are located here. It is also the site of the Nachi waterfall, Japan’s highest waterfall, itself an object of worship. Every July, the Nachi Fire Festival takes place, as it has for 1,500 years, to perform Shinto rituals. 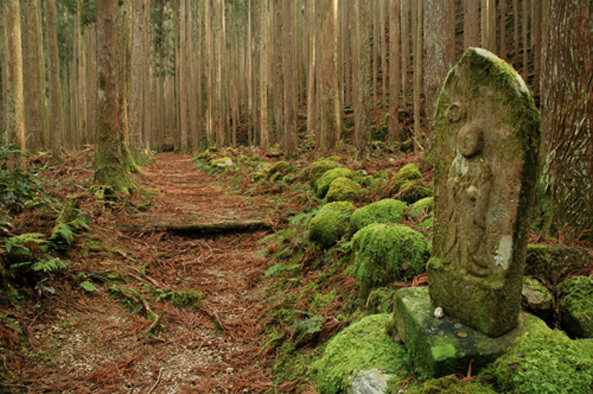 One of the founding deities of Japan, Izanami, is believed to be buried in the Kumano region. The third World Heritage site, the mountainous areas of Yoshino and Omine, is where the ascetic fusion religion of Shugendo took hold. Adherents practiced mountain climbing and other rituals as part of their spiritual training. A large tract of this mountain district is planted with 30,000 cherry trees, and an annual festival during the cherry blossom season draws crowds. Over the centuries, the Kii Mountain Range served as a crucible for religious and cultural development and exchange. It continues to be a site that attracts both sacred and secular interest. While historically the Kii Mountain Range has attracted pilgrims, current visitors are just as likely to be tourists. In 2004, UNESCO reported that the site attracted 15 million visitors annually, with large influxes during certain seasons. The site’s inscription on the World Heritage List was expected to attract 800,000 more visitors per year, as the region builds on the UNESCO designation to boost tourism—and, in turn, its economy. The Kii Mountain World Heritage site spans a large area, covering more than 1,200 acres, with a buffer zone of more than 28,000 acres. The challenge for the Japanese government will be managing tourism to such a widespread site. Vehicle congestion, increased foot traffic, infrastructure development, commercialism and cultural vandalism are the main conservation concerns. In response to increasing visitors following the World Heritage designation—and a resulting increase in litter and damage to vegetation—local volunteer guides stepped up efforts to mitigate the impact by teaching visitors about the region’s rich cultural history and building their awareness of environmental issues. In 2005, local governments and guide groups initiated efforts to recruit more guides to respond to the growing need, particularly for multilingual guides who could serve the influx of international visitors. In addition to the World Heritage status, much of the Kii Mountain Range falls within the boundaries of the Yoshino Kumano National Park, the Koya Ryujin Quasi-National Park and the Mount Omine Biosphere Reserve. Some commercial logging is allowed in the Kii Mountain Range on established tree plantations, but logging is prohibited in many areas within the site. Japan has multiple laws in place to protect the environmental and cultural assets of this sacred site, including the Law for Protection of Cultural Properties and the National Parks Law. Multiple structures and locations within the Kii Mountain Range have also been officially designated by the Japanese government as national treasures, natural monuments, places of scenic beauty, important cultural properties, or national historic sites. A cooperative arrangement is in place among the national government, the three prefectural governments that are part of the Kii Range, and private owners of temples or other structures to repair temples, maintain trails and provide tourism information. The Kii Mountain Range and its sacred temples and pilgrimage routes are currently well protected. The site has thrived for a millennium because the forests and mountains themselves are venerated. Bernbaum, Edwin. “Japan: Mountains of the Rising Sun.” In Sacred Mountains of the World. Berkeley: University of California Press, 1998. Boufford, David E., Yasushi Hibi, and Hiromi Tada. “Japan.” Hotspots Revisited.Chiba, Hitoshi. “Pathways to Paradise.” The Japan Journal, December 2004. Gray, Martin. “Introduction to sacred places of Japan and Mt. Fuji.” Sacred Sites. Shimbun, Asahi. “To be named a UNESCO World Heritage Site is a momentous event that can pull in tourists by the busload and revitalize communities.” International Herald Tribune, January 10, 2007. Tanabe City Kumano Tourism Bureau. “Sacred Sites and Pilgrimage Routes in the Kii Mountain Range.” Tanabe City Kumano Tourism Bureau. United Nations Educational, Scientific and Cultural Organization. “Mount Odaigharara and Mount Omine.” UNESCO-MAB Biosphere Reserves Directory. United Nations Economic, Scientific and Cultural Organization. “Sacred Sites and Pilgrimage Routes in the Kii Mountain Range.” UNESCO World Heritage Center. Wakayama Prefecture World Heritage Center. Sacred Sites and Pilgrimage Routes in the Kii Mountain Range. Yasumoto, Mariko. “Calls for change as WHS status threatens one of Japan’s gems.” The Japan Times, February 6, 2005.